Double trouble and a triple threat! 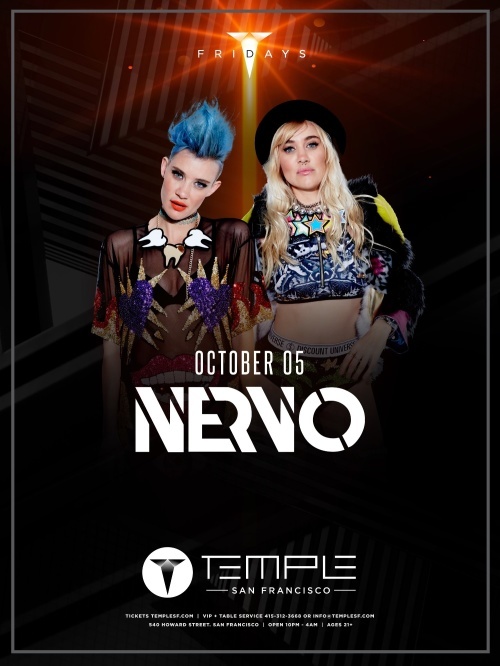 Australian twin sister duo Nervo, notable fashion models, musicians, and songwriters, are back at Temple December 8th. The sisters of NERVO have written and produced hits for the likes of Kylie Minogue, Ke$ha, The Pussycat Dolls, Afrojack, Steve Aoki and Miley Cyrus (Hannah Montana) to name a few, and received a Grammy Award for writing 'When Love Takes Over' for David Guetta and Kelly Rowland. Don't miss them on their fast track to rising stardom at Temple. RSVP to guarantee your spot to party and email [email protected] for a table.